The roasty coffee and dusty baker’s chocolate flavors inherent in imperial stouts have for years tempted brewers to put a dessert spin on them, adding ingredients such as vanilla, cocoa nibs, and spices to their beers. None of that is news in 2018. What is new is the recent rise of a subcategory of beers called “pastry stouts,” which have become as debated and misunderstood as hazy IPAs first were. The creation of the term “pastry stout” is usually attributed to sardonic beer blogger Don’t Drink Beer, who uses it as a catch-all for sweet beers flavored like candy bars, doughnuts, cake, etc., which brewers have been churning out to drinkers’ great delight or disdain, depending on your taste. We might once have called stouts with chocolate or vanilla “dessert stouts,” but pastry stouts—with names like Barrel-Aged Imperial German Chocolate Cupcake Stout, Maple Truffle Ice Cream Waffle, and (deep inhale) Maple Bourbon Barrel-Aged Imperial Mexican Biscotti Toasted Coconut Cake Break—are a league apart. Rather than just accenting the beer with subtle notes reminiscent of dessert, they strive for an over-the-top, liquid version of cake or pastry. Whereas pastry stout might have begun as a slightly derogatory term for an overly sweet, bakery-inspired novelty beer, breweries are finding these stouts have an enthusiastic following. You’ll now find brewers themselves describing their beers this way, embracing “pastry stout” right on the label. But what’s the difference between a pastry stout and any other stout brewed with say, vanilla and cocoa nibs? Lewinski makes this analogy: Pastry stouts are the ice wines of beer—without an ice wine’s elegance. But, he says, that over-the-top sweetness and candy-like flavor is what people want. Lewinski knows how to brew balanced, elegant stouts; his creations have medaled multiple times—including a 2016 Best Of Show—at Chicago’s annual Festival Of Wood And Barrel-Aged Beers. But that’s not what pastry stout fans want. 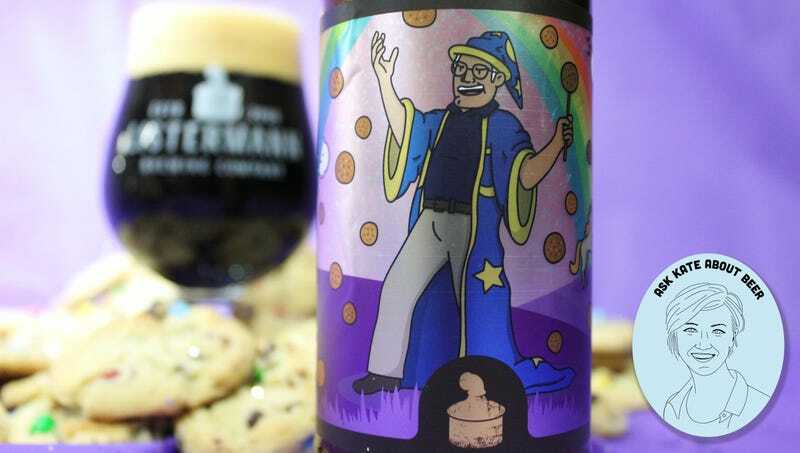 When Lewinski brewed a s’mores stout a little while back, he went for subtlety, balancing the marshmallow, chocolate, and graham cracker flavors with the beer’s malt base. People weren’t super into it. To make a stout that isn’t just reminiscent of a s’more but tastes like a straight-up melted s’more in a bottle, some brewers are turnings to extracts or flavorings or syrups added to the beer after it’s fermented. Lewinski says this initially made him cringe—his whole brewing education taught him to abhor such “cheats.” But, he says, these extracts actually achieve the precise flavors of a Thin Mint cookie or Neapolitan ice cream better than using those actual ingredients would. And thankfully, these extracts and flavorings have improved in recent years, tasting less chemically and artificial than they once did. “You find the company that puts out these flavors, and you can find something that tastes exactly like what it says it is. Is that lazy? Maybe. But I do know that’s what the market wants,” he explains. Process-wise, that’s the opposite of how many brewers create their beers. For a non-pastry perspective, I talked to Jared Rouben, brewmaster at Chicago’s Moody Tongue brewery. He was previously a chef, and creates what he refers to as “culinary beer.” But he admits: Pastry stouts totally bewilder him. He and I go back and forth, discussing how to explain what separates Moody Tongue’s nuanced Bourbon Barrel-Aged Imperial Gingerbread Stout or Chocolate Churro Baltic Porter from pastry stouts. This is crucial—as crucial as flavors—to defining a pastry stout: it’s thick and luscious, bordering on cloying in terms of its viscosity. That texture is the second component of what separates these stouts from Moody Tongue’s or any other drier stout. That full, oily texture comes from what brewers put into their brewing tanks. Many pastry stouts are packed with unfermentable sugars such as dextrose and lactose; those are referred to as unfermentable because the yeast doesn’t eat them up and convert to alcohol. So unlike the fermentable sugars from malts that yeast can turn into alcohol, these sugars just hang out in the final beer, tasting like straight sugar on your tongue. Why this preference for chewy, sweet, sticky stouts in the first place? Maybe it’s because they’re full of nostalgic candy and dessert flavors: Oreos, birthday cake, chocolate doughnuts. Or maybe it’s because they’re a sharp contrast to the esoteric, complex beers—like Orval, say—that keep beer geeks in such rapture. By now, we’ve established that Lewinski is conflicted about pastry stouts and the practices he uses to brew them. There’s a beer platitude that says brewers only brew beer they want to drink, but he admits he doesn’t really drink his pastry stouts. He’d rather go home to a solidly constructed pilsner. What Happened to Your Revolution, Bernie Sanders?